Editor’s note. This appears on page one of the September/October digital edition of National Right to Life News. Be sure to read the entire 41-page issue and share it with your pro-life family and friends. Fending off an assault that made the “high-tech lynching” of Justice Clarence Thomas seem tame by comparison, the U.S. Senate on Saturday confirmed Brett Kavanaugh to sit on the Supreme Court afternoon by a vote of 50-48. 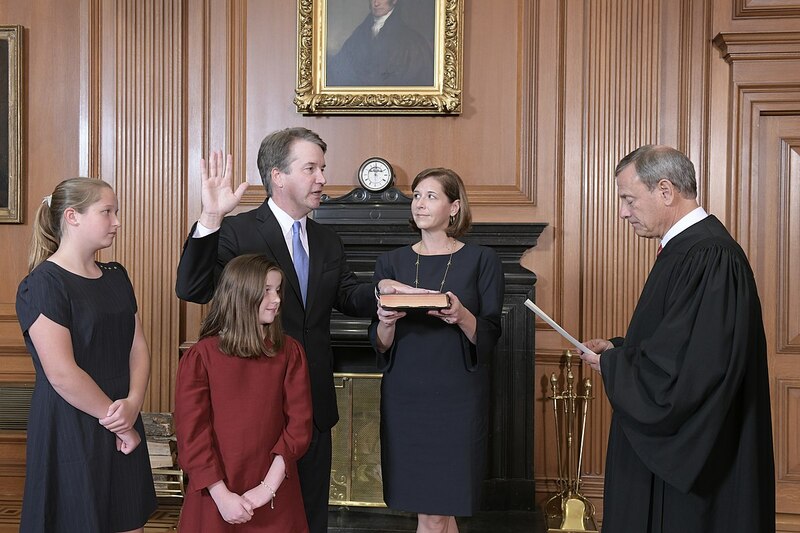 The 53-year-old Kavanaugh was officially sworn in hours later by Chief Justice John Roberts. Kavanaugh, who replaces Justice Anthony Kennedy, is President Trump’s second appointment to the nation’s highest court, joining Justice Neil Gorsuch. Various pro-abortion organizations, in particular Planned Parenthood, and left-liberal outlets warned of retribution against senators courageous enough to stand for the rule of law and the presumption of innocence. But recent public opinion polls have uniformly shown that the guttersnipe attacks against the 53-year-old Kavanaugh have galvanized pro-lifers and Republicans. The November 6 mid-term elections will determine whether the Senate remains under pro-life leadership. The die was cast Friday when following a thoughtful, lengthy, and emotional speech, Republican Senator Susan Collins of Maine said she would vote to confirm Kavanaugh, who had served for 12 years on the U.S.Court of Appeals for the District of Columbia Circuit. Sen. Collins’ position was unknown until her 45-minute-long remarks on the Senate floor. Shortly thereafter, West Virginia Sen. Joe Manchin (D) issued a statement in which he said he would also vote to confirm Kavanaugh. Pro-life Sen. Lindsey Graham (R-S.C.) delivered a heroic speech at a key juncture. Graham defended Judge Kavanaugh’s honor and reputation and called out the Democratic opposition for a willingness to do anything to defeat the nominee. National Right to Life, which applauded Kavanaugh’s selection on July 9 and worked in support of confirmation, added its congratulations. The confirmation vote fell entirely along party lines with two exceptions. As noted, Democrat Manchin voted in support. Republican Lisa Murkowski of Alaska, opposed confirmation but voted “present” as a courtesy to Sen. Steve Daines of Montana, who was away walking his daughter down the aisle. The importance of the future direction of the Supreme Court was clear from a 2016 CNN exit poll. The graph below is startlingly revealing. 56% of those who voted for Trump said it was the most important factor, compared to 41% for Hillary Clinton. Put another way, about 12% (56% times 21%) of those who voted for Trump said Supreme Court appointments were the most important factor, compared to about 8 % for Hillary (41% times 21%), a little over a three point advantage in one of the closest presidential elections of all time.